Chances are, you know someone at your barn with back problems or pain. Maybe you even have first-hand experience. With seemingly so many riders dealing with back issues, do riding and back pain go hand in hand? Not necessarily. There are ways to help prevent back problems, and even riders currently experiencing back pain can find ways to alleviate it and ride in comfort. According to an article published by the Mayo Clinic, four out of five adults experience at least one bout of back pain during their lifetime, and low back pain is the fifth leading cause of doctor visits in the United States. Back pain is a common complaint that sends a lot of riders to Dr. Craig Ferrell, M.D., team physician for the United States Equestrian Team, and Wendy Murdoch, from Washington, Va., a riding instructor who teaches from a science-based, biomechanical standpoint. “At least 30 percent of my clients come to me because of their back pain,” Wendy says. Before helping others manage their pain, Wendy had to learn to work through her own. In 1984 a horse she was riding reared up and fell on her. With a broken hip socket and a pelvis broken in two places, she began the long process of regaining her mobility—and ability to ride. Her explorations led her to study with Sally Swift, creator of Centered Riding, and Linda Tellington-Jones, creator of TTEAM and TTOUCH work with horses. 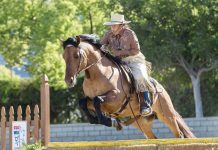 Dr. Ferrell sees high-level equestrian competitors and recreational riders alike in his practice, The Bone and Joint Clinic in Franklin, Tenn., and as team doctor for the USET since 1995. No matter their aspirations, a common theme among patients is that they want to find a way to keep riding. “There are many reasons for back pain, which is why it’s essential to have a medical diagnosis of the cause,” Dr. Ferrell explains. Once the cause is determined, the doctor can provide an individualized treatment plan. Our backs are marvelously complex structures that permit, in the absence of injury or abnormality, a wide range of movement. It is this flexibility and movement that allows us to sit a trot or canter, stick to a cutting horse or jump 5-foot oxers without inhibiting our horses’ natural abilities. Wendy says, “Once we stop thinking of the back as one big muscle with a rigid rod propping it up, we can start seeing it as an instrument that we can learn to play much like a piano. We can use a tiny effort, a little more effort, or a larger effort to match the intensity of the aid we want to give. Not everyone is blessed with a perfect spine. In addition to obvious injury, riders’ back problems can be brought on by structural issues that predispose them to back pain. Older riders have a higher incidence of disc problems. “Where the disc is inflamed and how badly it’s inflamed dictate how difficult it is to manage from an orthopedic standpoint,” Dr. Ferrell says. “With back pain, some people start with a relatively normal back and then develop problems. Others are born with abnormalities in their backs, which sometimes predispose them to certain injuries or problems. Spondylolisthesis, known as ‘slippage of the spine,’ and ‘transitional syndrome,’ in which the back joins with the sacrum or the pelvis abnormally, are two common abnormalities,” he says. When pain doesn’t originate from bone, it can occur from the soft tissues alone (muscles, ligaments and tendons) that support the spine. In addition, nerve issues can cause back pain. Depending on the cause of the problem, there are a variety of methods that can help lessen back pain. Beyond the initial pain associated with discogenic issues, the second phase occurs if the disc ruptures and hits a nerve and pinches that nerve. The rider can then develop leg numbness or weakness. “These cases are sometimes managed with an operation and sometimes with epidural steroids, where cortisone is injected around the nerves in the back. Depending on the situation and the circumstances, I’ve successfully done both for Olympic-caliber riders at various points in their careers,” Dr. Ferrell says. Formerly team physician for the U.S. swim team, Dr. Ferrell believes that swimming can be very beneficial for riders who have developed back problems. He says that the swimming motion provides gentle rotation to the back, and it uses the same trunk muscles and balance muscles needed for riding. Also, because you’re lying flat in the water, the discs are not loaded or under pressure. “I think many times taking up a swimming program as an adjunct to riding can be very beneficial to riders who have chronic, disc-related problems in their backs,” Dr. Ferrell says. Riders can take an active role in preventing back pain or problems by following some simple steps. Unfortunately, many riders—especially if they have no existing back issues—don’t pay much attention to their overall fitness and use riding as their only conditioning activity. Riders should commit to a well-rounded fitness program, including strengthening, stretching, warming up and body awareness, that can help keep back problems at bay. Exercises or activities that increase a rider’s body awareness are beneficial. Some popular methods are Pilates, yoga, tai chi, Feldenkrais, martial arts and the Alexander Technique (a method that works to change movement habits, improve freedom of movement, balance and coordination, and release unnecessary tension). “As in any sport, proper technique tends to decrease the load that’s focused on any one area of your body. So a lot of times, problems—whether back problems, shoulder strains or any other orthopedic complaint—are sometimes because you’re taking too much of the load in one place and not distributing it over your body,” Dr. Ferrell says. Wendy Murdoch has taught students who have fusions, slipped discs, rods in their backs, scoliosis and other issues, who come to her clinics with their doctors’ approval. 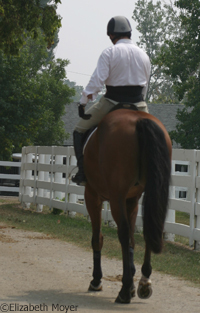 Wendy believes that the arched-back posture of some riders can cause muscle-related back pain. “Some riders may perceive they are riding with a ‘straight’ back, but their backs are actually arched. This can cause the back muscles to contract, which can cause pain. When the rider can find a position where the back is straight, but the muscles are not overly contracted, the rider is usually much more comfortable, and this position can alleviate a lot of the pain. “Their pelvis and seat bones should align underneath them, so the seat bones are pointing straight down rather than being ahead of or out behind the pelvis. When the pelvis is underneath the rider, it and the rest of the skeleton can support the rider without relying on overuse of muscles to stay on the horse,” Wendy says. I had a horse rear up and fall on top of me too. However, I was lucky enough to only have a stressed fracture in my pars. The doctor didn’t allow me to ride for 2 months! However, after the end of the three months, My back was feeling much better. I have had to slowly get my balance back and am almost in as good of shape as I was before the accident. I can still feel the pain, but it doesn’t stop me from riding! I loved these tips on getting through back pain! Thank you so much, and keep them coming! I had 2 back surgeries in 1 year, the last fusion with little rods and screws. I am just getting back to riding 18 months after the last surgery and am a little nervous. Sometimes I get pain doing the sitting trot. I enjoy articles like this one to keep me positive. A horse falling on me…my worse nightmare! This helped alot as I am a very unbalanced rider and struggle with scoliosis. I always feel lopsided but this will help me to develop inner core strength.